Kalyanji Anandji’s association with Mohammad Rafi. In the Golden age of Indian film music, many composers have enriched the firmament of music with their innovative compositions, yet they did not get the recognition they deserved. Kalyanji Virji Shah (born in 1928) and Anandji Virji Shah, (born in 1933) better known as Kalyanji and Anandji, started their journey with the film Samrat Chandragupta, in 1958. In early 60s, Kalyanji Anandji provided successful tunes in Raj Kapoor’s Chalia, in 1960, where songs like “chalia mera naam”, “dum dum diga diga” becoming successful. Due to strong dominance of Shankar Jaikishan in that era, most of the music lovers could not dissociate compositions of other composers, and thought it was S J’s composition. In Raj Kapoor’ film Dulha Dulhan, 1964, Mukesh’s song “humne tumko pyar diya hai jitna” was composed with tragic andaz. Kalyanji Anandji associated with Mohammad Rafi, the man dominating the world of playback singing in that age in Shammi Kapoor’s film Bluff Master, 1963, where most of the songs were sung by Rafi followed by Joy Mukherjee’s Ji Chahta Hai, in 1964. The most successful composition of the musical duo came in 1965 with Shashi Kapoor’s film Jab Jab Phool Khilen, where Rafi’s songs ‘pardesiyon se na ankhiyan milana”, “mai yahan ek ajnabi hun”, “na na karke pyar” becoming super duper hits. In the film Himalay Ki God Me, 1965, Kalyanji Anandji’s composition and Mukesh and Lata’s songs became successful. In 1967, Kalyanji Anandji won filmfare award for their superlative composition in Manoj Kumar’s Upkaar. Manna Dey’s song “kasme wade” was as successful as Mahendra Kapoor’s song “o mere desh ke dharti” and Rafi’s duet song with Asha Bhosle “Gulabi raat gulabi”. Rafi’s combination with Kalyanji Anandji continued in Shashi Kapoor’s Haseena Maan Jayegi, in 1968, with songs like “Bekhudi me sanam”, “Chale the saath milke” and the songs in the film Raaz, 1967, where Rafi’s song “Akele Hain Chale Ayo” becoming very popular. Mukesh’s song “Chandan sa badan” from the film Saraswatichandra, 1968, was also successful. Kalyanji Anandji composed legendary bhajan for Rafi titled “sukh ke sab sathi, dukh me na koi” in Dilip Kumar’s film Gopi, 1970. In the 1970s, Kalyanji Anandji provided successful songs to Kishore Kumar including “Zindagi ka safar” in the film Safar. Rafi’s song in Raj Kumar’s Maryada, 1971, titled “tu jo aja” had an everlasting effect in the film. 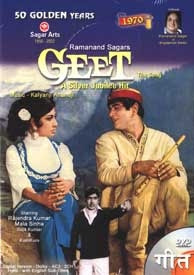 Kalyanji Anandji’s composition included hilly tunes composed in Rajender Kumar’s film Geet, in 1970, where Rafi’s songs “aaja tujhko pukare mere geet” becoming everlasting hit. 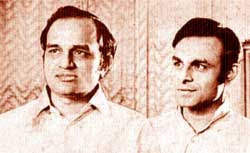 Kalyanji Anandji were the only musical duo along with Laxmikant Pyarellal, who could blend their own skills with the general taste of popular cinema which changed with passage of time. That was the reason why Kalyanji Anandji succeeded in composing successful songs for Firoz Khan’s films Apradh, 1972, Dharmatma, 1975, Jaanbaaz, 1986, which were spread out in two decades. He even composed successful songs in action pact films like Muqaddar ka Sikander, 1977, where he asked Kishore Kumar to sing the song “rote hue ate hai sab” for Amitabh Bacchan in the happy mood, and Mohammad Rafi to sing the same song in sombre mood for Vinod Khanna in the same film. It is difficult to compile the contribution of Kalyanji Anandji in a short article because they had created everlasting hits in the 50s, 60s, 70s, 80s and even 90s. But they had grand association with Rafi, and wherever they got opportunity the combination had provided immortal songs which can be preserved for immense musical value. Immortal Ghazals sung by Mohammad Rafi. Awards received by Mohammad Rafi in his illustrious career. Mohammad Rafi- the greatest voice of the last century. Rahul Dev Burman’s immense respect for Mohammad Rafi. Laxmikant Pyarellal’s immortal relationship with Mohamand Rafi. OP Nayyar’s immortal relationship with Mohammad Rafi. Salil Chowdhury’s relationship with Mohammad Rafi. Ravi’s memorable combination with Rafi. Roshan's everlasting bond with Mohammad Rafi. SD Burman and Mohammad Rafi. Rafi’s pleasant memories with Madanmohan. Khayyam and Jaidev’s relationship with Mohammad Rafi. One should not forget to include "oh tumse milke" from Adalat and "Peetey Peetey" from Bairaag. Uttam Kumar's influence on Bollywood films.